What started as a clear and undefined need for an Up Knörth adventuremobile ended with the purchase of a 1961 Triumph T20 Scrambler Light. Chosen for it's on and offroad ability and the light single cylinder engine that can easily navigate the technical trails of British Columbia and beyond. There will be hours spent sourcing gaskets, o-rings, pins and bolts; A small price to pay for being able to translate the mechanics as you tweak the throttle. The T20SL has a 9:1 piston, 'R' cam, sports valve springs and a crankcase shield. The gears are close ratio with internally sprung heavyweight front forks meant for offroading, while still retaining street legal requirements. For all intensive purposes this was - and is - a great bike to cruise through the city and go off on a weekend jaunt. 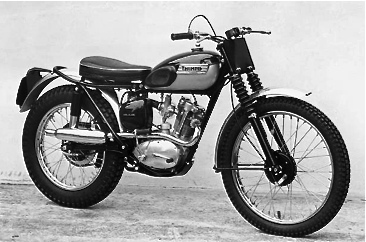 Another part of the Tiger Cub heritage is the TS20 Scrambler Cub that was used for trails and was as close as possible to what the factory riders used in competitions. Part of the reason for the selection of the T20SL is that it shared the same engine tuning and suspension that made the TS20 so accomplished off-road. The end result of our custom adventuremobile will take the best mechanically and style-wise from both of these to make our own practical rendition.